Falcon Class Motor Minesweeper: Laid down, 17 April 1953 as AMS-195 by Broward Marine Inc., Fort Lauderdale, FL. 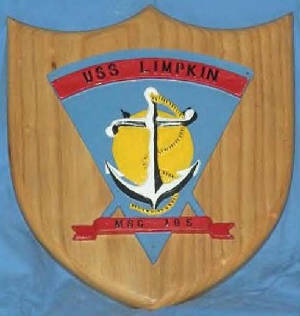 ; Launched, 21 May 1954; Reclassified as a Coastal Minesweeper, MSC-195, 7 February 1955; Commissioned USS Limpkin (MSC 195), 26 March 1955; Decommissioned, 26 September 1968 and placed in service as a Naval Reserve training ship, based at Perth Amboy, NJ; Transferred to Indonesia in 1971 as Pulau Anjer (M 719); Struck from the Naval Register, 1 May 1976; Disposed of for scrap through the Defense Reutilization and Marketing Service 1 September 1976. Specifications: Displacement 362 t.; Length 144 3"'; Beam 27' 2"; Draft 12'; Speed 13.6 kts; Complement 40; Armament one twin 20mm; Propulsion 600shp Packard diesel engines, two shafts. Coastal minesweeper nonmagnetic construction, wooden hull and stainless steel, aluminum, and bronze engine and hull fittings.Fitted with UQS-1 sonar. Range is 2500 miles at ten knots. WOODEN SHIPS AND IRON MEN a book by CDR David D.Bruhn USN RET.The history of our MSO's from 1953 to 1994. To learn more about this excellent minesweeper book please visit CDR Bruhn's website at the link below.